I have been wanting to post on this subject matter for a long time. We have been making twice a month treks to the local library since Thomas was a year and a half, thereby finding his own in the way of favorite pieces of literature. Because I have waited so long to get this all down, favorites have come and gone like the ebb and flow of the tide. But before he take on any more new stories, I want to share some of his favorites over the last year. I didn’t realize a kid could have a favorite author, but Thomas seemed to lean towards particular writers (even if they used different illustrators). 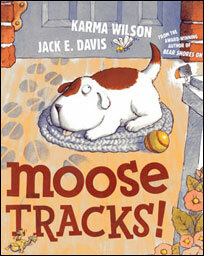 Karma Wilson was one of those… The Bear Snores On was the first book given to us as a shower gift but by far his favorite of her many stories was Moose Tracks, about a messy moose who apparently forgot he was one. Another good read is Animal Strike at the Zoo. Mo Willems is another one on the favorite list during the past year. He has had a number of favorites from this amazing author/illustrator. I think the best quality Mo Willems is able to conveys through his stories is expression of sarcasm and surprise. I have fun reading the books because his characters demand to be heard. His most well-known (I think) and the first book we were given, Pigeon Finds a Hot Dog got us hooked. The Piggie and Elephant series are hilarious. 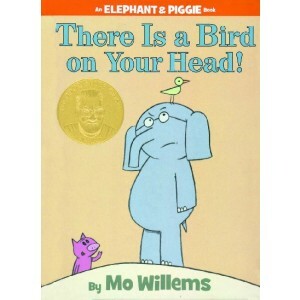 Roger loves the 2008 Geisel Award winning book, There is a Bird on Your Head while I love I Broke My Trunk. Naked Mole Rat Gets Dressed is high on the list too. I need to reserve Time to Pee for the boy who is still struggling with potty training. As many as I thought we have read, I think there is more to get through, but it seems now he is not nearly as excited as we are. 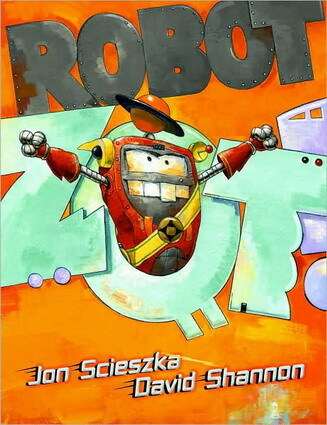 Another favorite authors of his is Jon Scieszka. We read a few that didn’t get is attention early on like Cowboy & Octopus and The True Story of the Three Little Pigs, but it wasn’t until we brought home a TruckTown book that he seemed to show any interest. Right now he is hooked on Robot Zot, a tiny angry robot who comes to Earth and attacks appliances. I like it for the fun voices I get to make for the characters, he might like it for the same reason. Perhaps I may have to return to those previous books to see if he just wasn’t ready for them. Of course there are several books that he just loves because… They are like the one-hit wonders of his book reading. 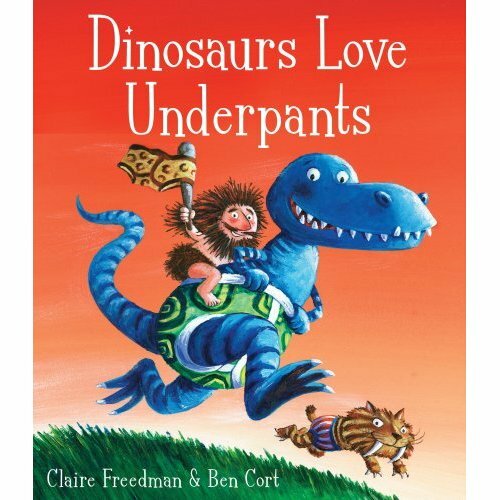 Dinosaurs Love Underpants is one of those books. I like this book, but have a hard time with the rhymes as it is clearly written by someone with a different accent (Claire Freedman is from the UK). For example rhyming “shock” with “amok” or “claw” with “war.” It to me a few tries before I was able to recite it as intended. 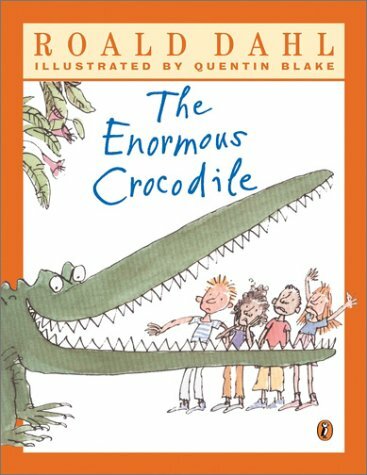 Right now he is into one of Roald Dahl‘s shorter stories, The Enormous Crocodile. This mean crocodile (Thomas insists we can’t call him croc, I think he has an aversion to the shoes too) makes several failed attempts at gobbling up children with his not so clever tricks, foiled by other forest animals. Again I really think he enjoys the characters’ voices in this one. I am excited that he can sit for this longish book knowing there is a whole world of new options to read. I’m hoping to sit down and do this every few months as his interests change. It will be good for me and hopefully some recommendations or rereads for you.